Prepared from selected fruiting bodies by traditional hot-water extraction and containing over 30% mushroom polysaccharides (beta-glucans, proteoglycans and heteropolysaccharides). Manufactured in the U.K. to EC food standards and are suitable for vegetarians and vegans (capsules are of plant origin). No additives are used and the products are dairy, gluten, maize and soya-free. 60 x 400mg vegetarian (HPMC) capsules. 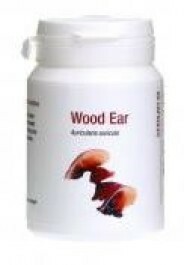 MycoNutri Wood Ear is prepared from selected fruiting bodies by traditional hot-water extraction and contains over 30% mushroom polysaccharides (beta-glucans, proteoglycans and heteropolysaccharides) by weight.